Whether your safety program is brand new or fairly established, adding regular safety meetings is always a good idea. When it comes to workplace safety, there is no better time to promote new ideas or reinforce safe working habits than in a safety meeting. The “safety department” may look very different from company to company. It may simply be the business owner trying to do their best with their small team or the additional responsibility of safety may have been delegated to an already overworked HR manager. Maybe there is one person who is responsible for project management, quality and safety (and anything else that comes up) or maybe the site supervisor or job foreman also knows they have to add in safety measures where they can on the job. As any company grows, there could be the opportunity to add a full-time safety manager, safety director or safety team to support the needs of the business and that’s when things can get exciting, but until then our goal is to help make sure you’ve got safety covered with whatever resources you have right now. As any safety program is getting started, it is often personnel within the company who are very competent and highly skilled in their industry that have the job of implementing the safety program but OSHA safety standards and requirements may be new to them. Taking time out of their already busy schedules to work on the safety program often poses unexpected challenges. We recognize that is very often the case. To answer an often-asked question, we have put together our step-by-step guide to hosting a safety meeting. How do I have a safety meeting? 1. Notify the owner or top management of your intentions and get their support. If you are the owner, or top management, then great, you should know that you are doing the right thing. 2. Let your employees, crews, and teams know that you will be holding a safety meeting or starting a safety meeting program. Use the communication method most likely to reach everyone. This could be email, texting, a poster on the common area bulletin board, a calendar invite or an announcement at the start of shift or end of shift crew meetings. Let everyone know the date, time, location, length and purpose of the meeting. 3. Decide on the theme, subject, or topic of the safety meeting. The topic of the safety meeting should be relevant and timely. For example, you obviously wouldn’t cover heat stress with an outdoor crew in December. Think about the tools and equipment your teams use often or what hazardous situations may be likely to occur on the job. No topic is too dumb or too easy. It is important to cover the basics like ladder safety, PPE and electrical safety often. A landscaping crew would benefit from ladder safety, hand protection and poisonous plant avoidance. A warehouse team or distribution center may need safety topics on forklifts, hard hats, proper lifting and struck-by hazards. A construction company will have safety meetings on everything from heavy equipment and caught-in hazards to trenching and PPE requirements. 4. Prepare for the safety meeting. An experienced foreman may be able to lead a safety meeting with just a few key points and a discussion. For those not so confident, we recommend having 1- 5 pages of safety information on the selected topic to refer to and read from during the meeting. Safety information can be found on OSHA’s website, free toolbox topics found online, or the high-quality safety topics provided by Weeklysafety.com. Tip: Photographs are the best! Show your teams what is correct and also what is wrong. Telling someone is okay but showing them helps them remember. Demonstrations, when possible, add an additional layer of comprehension and interaction so plan a hands-on activity if you can. Also, don’t forget to refer to the actual OSHA standard for the safety rules you are covering during the safety meeting. 5. Send out a reminder of the safety meeting the day before the meeting is scheduled to be held. Hosting safety meetings on a regular schedule is best for everyone as it eliminates confusion and doesn’t disrupt the normal work day once everyone gets used to the schedule. At the beginning of every shift or at the start of the work day is a great time to host safety meetings to get crews into the right mindset for the day. Tip: It is best to hold the safety meetings during the normal working hours. If you require employees to come in early or stay late it is disruptive to their normal routine and there may be resentment, late-comers, and no-shows which can defeat the purpose. 6. Start the safety meeting on-time. At the first safety meeting, set the expectation that the safety meeting will start on time and everyone is expected to be present when the meeting starts. If the meeting is scheduled for 8:00am, expect everyone to be there at 8:00am and pass around the sign-in sheet. As you enter the room, open conversations with people for the first couple of minutes to promote a friendly, relaxed atmosphere. Once everyone has signed-in, then begin the safety meeting. 7. Everyone should be able to see and hear what’s being presented. The setting of the safety meeting is up to you. It can literally be a tailgate meeting where everyone is standing around the foreman’s truck or it can just be held at the back of a loading dock or just inside a delivery area. Look to see if there is a work trailer that fits the crew or a conference room or spot in the warehouse you can use, any of these situations will work. Tip: You do not need to have your safety meetings in a formal setting with chairs, a projector, and snacks. If you do, that’s great! But don’t let logistics like that stop you from having a safety meeting. The message is what is most important and if the team can hear you, see what you are demonstrating and participate in a discussion, then that is what is most important! 8. Provide introductions and set expectations. Introduce the person leading the safety meeting and then start the meeting by introducing the safety meeting topic and the objective of the meeting. For example: “During this meeting, we are going to learn how to complete a ladder inspection checklist and understand the requirements for completing ladder inspections.” Request that cell phones be put away and full attention be given during the meeting. 9. Present the information clearly. You can project the information onto a screen, pop open a laptop, print out copies for everyone, or you can simply talk about the important points out loud and go over anything you need to emphasize or clarify. 10. Save time for questions, comments and discussion. Discussion is important so let the employees know if you prefer questions and comments during the presentation or if you wish to limit the discussion to the end. The safety meeting leader doesn’t have to be the one to answer all the questions, let veteran employees give feedback or tell stories based on their experiences if questions come up that they can answer. 11. Wrap-up the safety meeting. Be mindful of the time so that employees don’t become distracted or anxious about getting back to work. If there are still questions that couldn’t be answered, encourage those employees to see the safety meeting leader or site supervisor directly after the meeting. Make sure those employees know that you want to address their concerns also. 12. End on time. Employees have a job to do and they are expected to complete their tasks whether they are allowed enough time or not. Those in attendance will appreciate it when you acknowledge that their time is valuable. Make sure that everyone has put their name on the sign-in sheet or allow them to do so when the meeting is over. 13. Follow-up the safety meeting with important reminders. 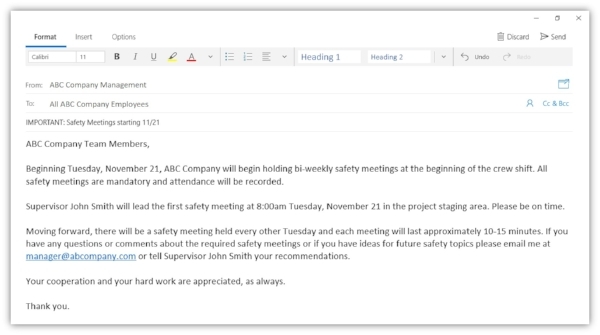 For example, send out an email listing the key points of the meeting, post a safety reminder on the bulletin board or ask top management to send a message to all employees that promotes safety. 14. Solicit feedback and be open to suggestions for improvement. Consider asking for feedback at the end of or after each meeting or by email after the meeting. You will be surprised at the great ideas your team has and keep in mind… if the safety meeting topic was their idea and it’s important to them then they will be more likely to be engaged at the next meeting. 15. Do it again! Keep the safety meetings going! This demonstrates to your employees that management cares about their safety and well-being. Set a regular schedule for safety meetings and stick to it. Don’t skip the safety meeting if things get busy – that only sends the message that safety isn’t that important. Don’t worry about repeating the same safety topics, reminders are always a good idea and many safety topics should be repeated throughout the year. For more ideas on preparing for and holding safety meetings check out 4 Simple Steps to Effective Safety Meetings and don’t forget to browse our blog for other excellent articles on improving your safety program. 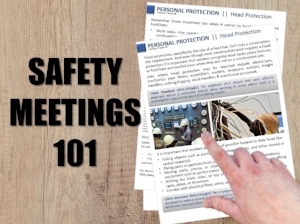 If you need some ideas for safety meeting topics or would like to save time when you are preparing for safety meetings then we’ve got you covered. Take a look at how Weeklysafety.com can help your company have successful safety meetings, every time!